Van"Ike" Wright Memories of a Tail Gunner 10 Oct 1943. Our aircraft "Terry and Ten" for some reason was not available on that day probably because we had participsated in raids on 8 Oct at Breman and had lost or required Maintanance on many and replacement of crew losses.Replacement aircraft had not been received to cover the losses at Bremen.The Group could only put up 18 aircragt so they added 2 aircraft from the 390th BGp to make an even 20. During Black Week 8 Oct Bremen- 9 Oct Marienberg-10 Oct Munster-14 Oct Schweinfurt were all well defended creating Heavy losses. I and our crewwere in the 418BSq. but were assigned to fly that day in A/C 42-3007 Sweater Girl of the 350 LN-Q 100th BGp. 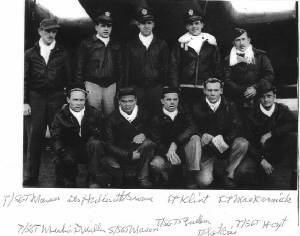 This is the story of the tailgunner on Sweater Girl one of the 12 aircraft lost that day from the group.The crew picture below was assembled apparently by the mothers of those on the crew.They attempted to keep in touch. We were Flying at 20-22,00 ft when fighters came in soon after we entered the area.Flak was very heavy just prior to the fighters arrival.We could see planes of our Group blowing up and going down. I think our aircraft Sweater Girl was hit before we dropped our bombs. It was probably while we were on the bomb run to the target. ME 109's,ME 110's, and JU 88's accounted for many of our losses.They were firing rockets and we took a hit at my tail gunners position next to my left shoulder.Our intercom was dead,my guns were useless,and the control wires were hanging down. I decided to crawl to the waist, as I knew our plane was in deep trouble.The rocket damage hole was so large I could have jumped through the hole. When I got to the waist I saw S/Sgt W.M.Field and S/Sgt E.O.Preble. They were both on the floor. Field was bleeding and Preble's Oxygen mask was off and he was bleeding from the mouth,but,he got to his feet. I crawled to the ball turret position and there was no movemennt from him.The plane started to bank and lurch, so I went to the side door, opened it,and motioned to Preble that we were going to jump. He motioned me to go ahead and shook his head yes that he was ready to go too. I must have been the last man to jump,for I saw no other chutesand the plane was spriling down quickly. I saw the plane crash and burn. I landed near trees and pulled my chute in and hid till dark. I started walking north till morning and hid in a haystack early that morning. Two dogs spotted me and the farmers came running with their pitch forks---Note HQK-Many aircrew were attacked by farmers and were killed by the farmers pitchforks. We were advised to avoid civilians,Hitler Youth,and SS. Wherever possible attempt to escape or turn ourselves in to the military if escape appeared impossible.----Then German soldiers appeared from Munster and handcuffed me. I then was taken to Frankfurt-on-the-Main and was photographed. Then to Stalag 17B for the duration. 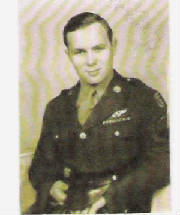 During my stay at Stalag 17B I did not meet or see any of the Squardron Crews. 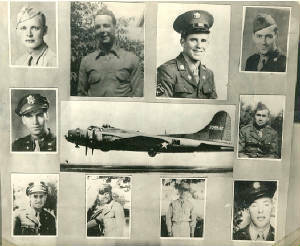 Our aircraft was brought down by rocket fire, but our crew members Sgt's Field,Coombs,Prebble and Lish--I'm certain were killed by machine gun fire or wounded to such an extent they were unable to depart the falling aircraft. I did expect to see Preble descend with me even though he was wounded. I know nothing about the rest of the crew until after we were liberated. I found out that Fields, Preble,Lisch, and Coombs had been killed and one of the officers had been wounded.